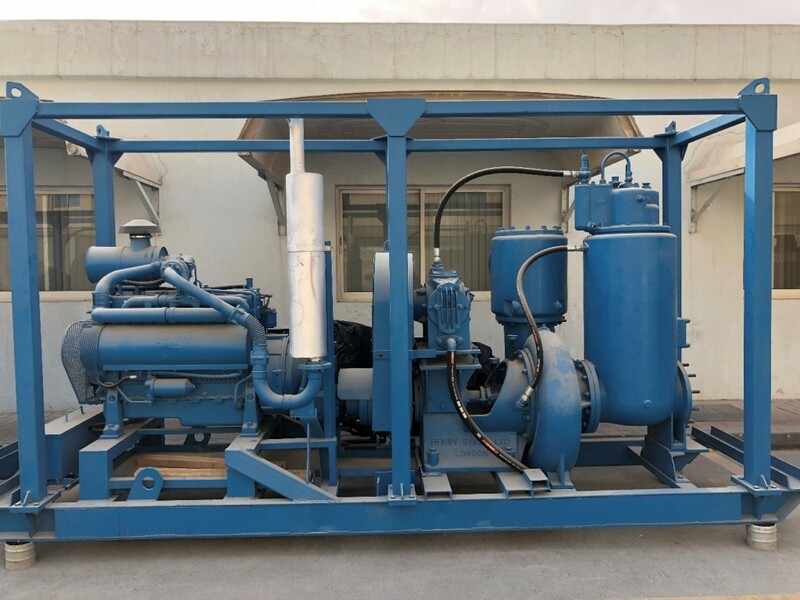 Khansaheb Sykes LLC the leading OEM for dewatering pumps across the UAE and GCC region ready to deliver the first batch of 15 Dewatering Pumps units for Emergency Dewatering Services to the local Government authority. Khansaheb Sykes is a well-known brand across the UAE region offering Quality dewatering pumps for all dewatering solutions. The dewatering pumps delivered to the authority are driven by Lister Petter ‘T’ Series air cooled-TR3 range Engines known for its reliability and operational capability in harsh environment. “We consider Khansaheb Sykes an important OEM partner and during the next few months plans are being put in place to strengthen this partnership further. 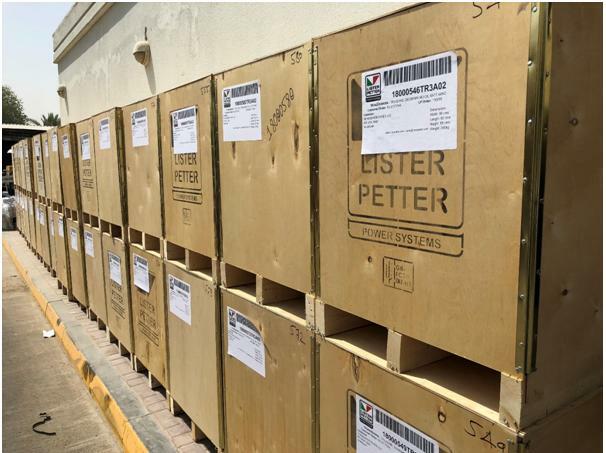 A product support training for Khansaheb Sykes Engineers is being put in place that will result in better and on time local product support for Lister Petter Engines in the region”. Rajesh Sadhu Director for Lister Petter Power Systems had meetings with Mr.Jamie Smele General Manager and Mr.SR Krishnan Sales Manager for Khansaheb Sykes. Our presence in the Middle East spans over 4 decades and the fact that Sykes Pumps celebrated its 160th year throughout 2017 into 2018 confirms that the Sykes branded pumps are leading the competition as a dewatering pump supplier in the MENA region. To complement this order Lister Petter TR3 was the preferred engine along with Spark Arrestors, Chalwyn Valve, battery isolators and engine oil cut out controls. With 160 years of experience in manufacturing and distributing pumps all over the world, Khansaheb Sykes has recently finalized yet another sale contract in Oman. Having the capability to sell and dispatch pumps throughout the Middle East, including UAE, Oman, Kuwait, Saudi Arabia and Bahrain. Khansaheb Sykes’s team ensures that the right equipment is delivered at the right time. 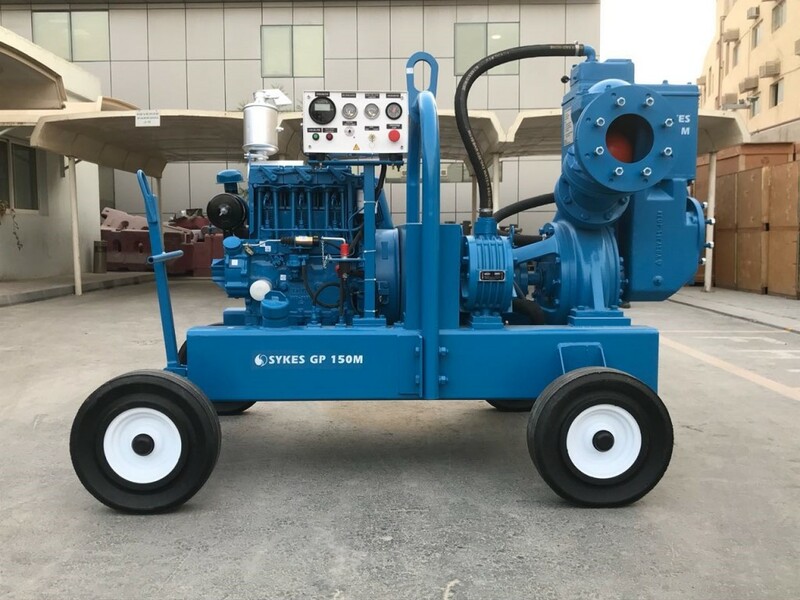 The Sykes GP100 dewatering pumps were ordered by our trading partner in Oman, Al Ansari Trading Enterprise LLC for a client in the government sector in Oman. 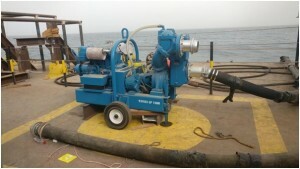 The dewatering pumps as per the client’s requirement can handle both clean and dirty water containing limited solids. 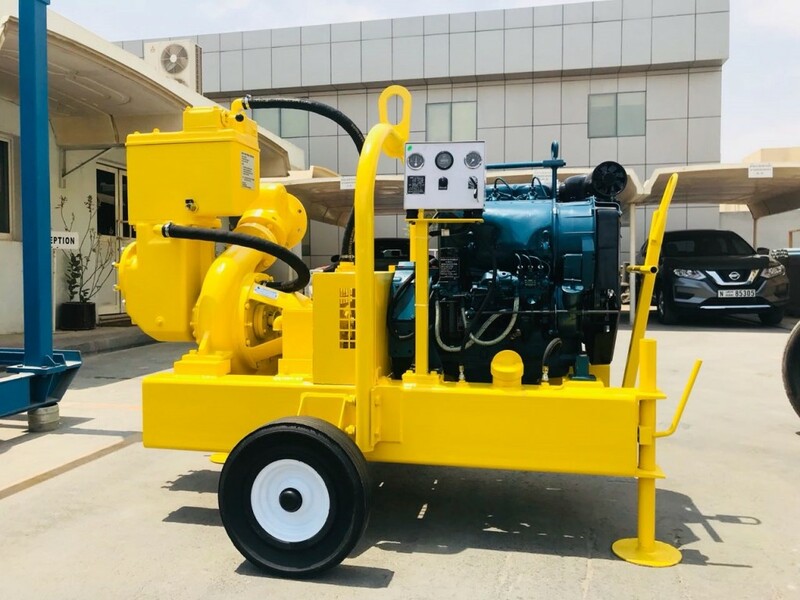 The powerpack fitted to these dewatering pumps was the Kirloskar HA294 Engine which comes complete with all engine emergency shut off features. The GP 100 dewatering pumps as like all the dewatering pump offered by Khansaheb Sykes, include the unique Sykes Univac high flow automatic vacuum system, which enables the pumps to prime and re-prime fully automatically, allowing for fast draw down and excellent air handling characteristics enabling the pump set to maintain constant vacuum when used on Wellpoint Dewatering systems. If you need any information or advice on dewatering pump hire or sale, dewatering equipment, dewatering system installation, dewatering solutions including wellpoint or deepwell dewatering, feel free to contact us! With 160 years of experience in manufacturing and distributing pumps all over the world, Khansaheb Sykes has recently finalized yet another sale contract in the UAE. Having the capability to sell and dispatch pumps throughout the Middle East, including UAE, Oman, Kuwait and Bahrain. Khansaheb Sykes’s team ensures that the right equipment is delivered at the right time. 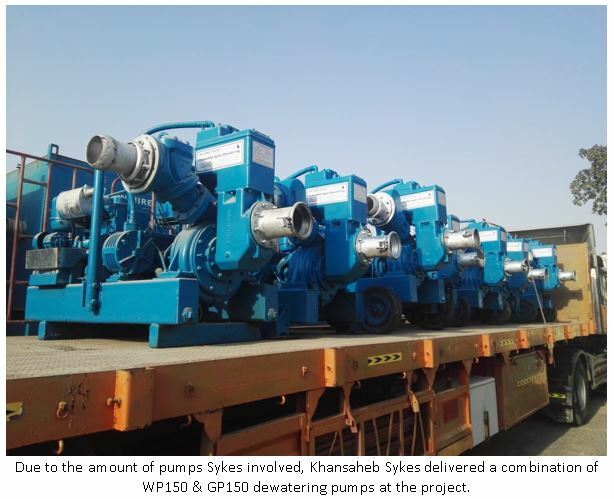 The Sykes WP 150/60 dewatering pumps were ordered by a dewatering company based in Dubai with a Kirloskar engine as the preferred power pack. 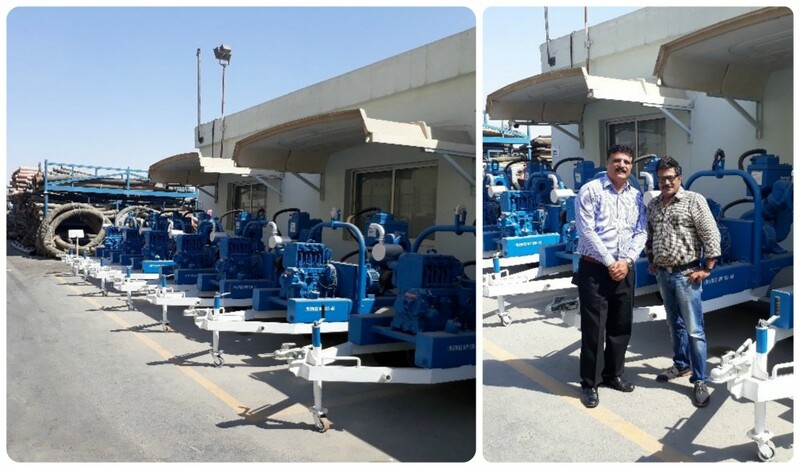 Unlike the regular bright blue colour you see on Khansaheb Sykes Pumps, these pumps have been painted “yellow” as per the client’s request. They have been manufactured in the United Kingdom, and assembled and tested in the UAE. Before dispatching the dewatering pumps, they have been individually inspected thoroughly. 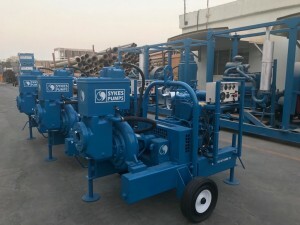 The Sykes WP 150/60 dewatering pumps offered by Khansaheb Sykes includes the unique Sykes Univac high flow automatic vacuum system, which enables the pumps to prime and re-prime fully automatically, allowing for fast draw down and excellent air handling characteristics enabling the pump set to maintain constant vacuum when used on Wellpoint systems. If you need any information or advice on pump hire or sale, dewatering equipment, dewatering system installation, wellpoint or deepwell dewatering, feel free to contact us! Sykes pumps turned 160 years old in 2017 and a testament to its heritage is that dewatering pumps manufactured many years ago still operate in the pump hire rental fleet. Khansaheb Sykes maintain a rental fleet of the Sykes UVS12 dewatering pumps which operate alongside their current range of dewatering pumps. The Minivac Eco, 3inch general purpose pump giving a performance of Max Head 28m, Max Flow 15l/s and a maximum solids handling of 28mm. GP200M giving a performance of Max Head 43m, Max Flow 161l/s and a maximum solids handling of 75mm. Continuous improvement and change towards betterment are what drives us at Khansaheb Sykes in serving you better each time to ensure this continues Khansaheb Sykes has just taken delivery of the JCB range of generators. First into the fleet is the JCB Q65QS Silent Unit which is a versatile Diesel Generator for a range of applications. 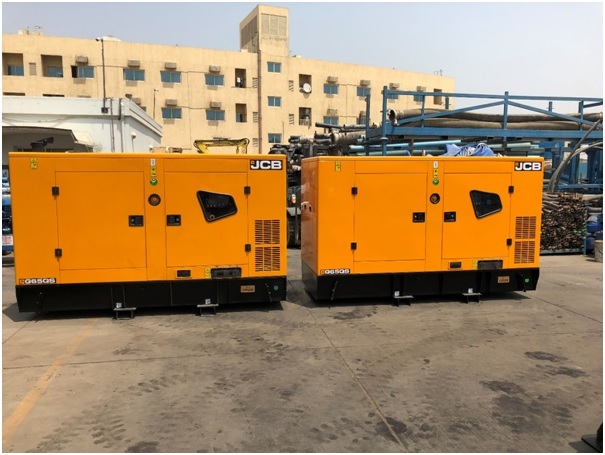 At the heart of the 65kva generator range is the JCB 4Cylinder Dieselmax Engine providing the power, delivering low fuel consumption, increased efficiency and low noise to deliver a superior performance, even the harsh Middle Eastern climates. Ergonomic DSE panel as standard. Sykes GP150M dewatering pumps operational as ballasting pumps. The Sykes range of dewatering pumps can be utilised on a number of applications, as a wellpoint dewatering pump, used as a booster pump on deep well dewatering projects where the discharge point is not in close proximity to the project site, for sewage over-pumping and general pump hire. 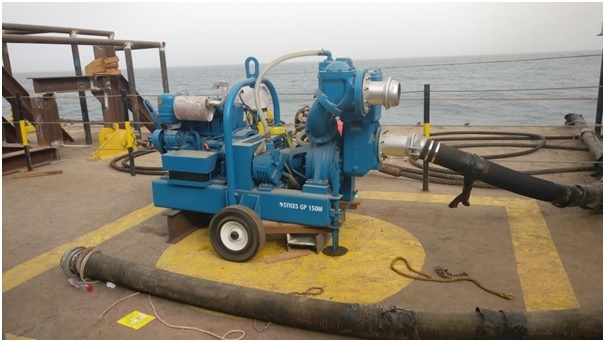 On this occasion the Sykes GP150M dewatering pump has been used on an off -shore ballasting application. 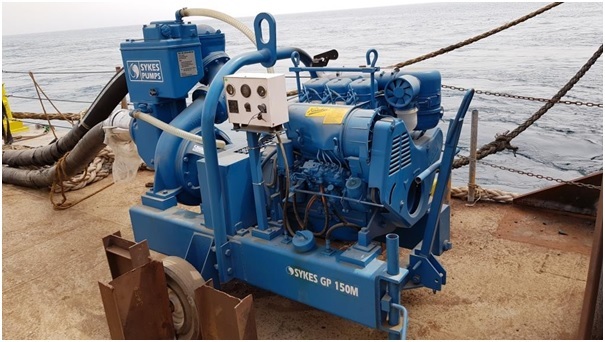 Khansaheb Sykes’s has again met customer expectations with its bespoke dewatering pump hire, ensuring that we always supply the optimal pumping solution for any project no matter how big or small. We are very pleased to announce our renewed partnership with Lister Petter Engines. Under the guidance of the New owners Sleeman & Hawken, Khansaheb Sykes are confident on returning the trading relationship between both companies back to the levels seen in previous years. Excavations are necessary for construction of firm foundations for the buildings. Deep excavations are very challenging as groundwater is prone to become an obstruction during the excavation progress. 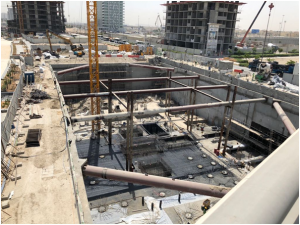 When a leading contractor in Abu Dhabi was looking for a perfect dewatering sub-contractor for controlling ground water for the construction of a highrise building where an excavation of over 20 meters was required, Khansaheb Sykes was approached to control the water levels. Deepwell dewatering is the most suitable method for controlling groundwater for excavations which are deeper and are not possible to be dewatered by installation of Wellpoint’s. Once the final excavation limit was reached, the installation of a gravity drainage system was carried out and once fully installed our engineers withdraw the temporary installed deep well systems inside the plot area and the permanently deep well systems which are installed within the shoring wall will handle the dewatering after that. The installation of gravity drainage system is an added advantage as there will be no opening in the raft, the civil contractor doesn’t need to make any opening in the raft, making the drainage system full proof.